The TDA Chameleon Drain is a novel basin originally designed for use on baseball fields to quickly drain surface water without interfering with play. On golf courses, Chameleon Drains can be used in high profile areas such as tees or greens approaches, or areas that are visible on TV during tournament play. 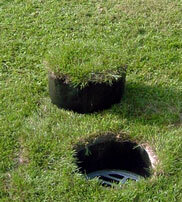 Placed below grade, the Chameleon Drain has a removable grass top during normal weather conditions. 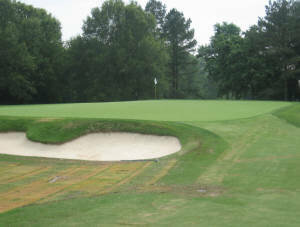 When rain causes standing water, the grass top is removed, and surface water is quickly drained so that play can resume. Upon replacement, the basin virtually disappears. 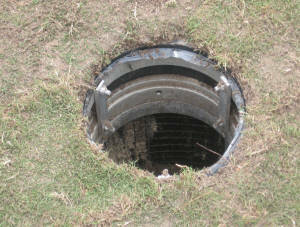 A temporary grate can also be put into place instead of the turf plug for use during the “wet season” when drainage is a priority.